While many of us may view livestock manure as a waste product, farmers all over the world rely on it as a valuable source of crop nutrients, soil organic matter, and renewable energy. Whether farmers can utilize the nutrients and energy contained in manure, however, depends in part on how the manure is managed. Manure management encompasses all activities associated with the handling of dung and urine, including excretion, collection, storage, anaerobic digestion, treatment, transport and application to fields. It thus also determines losses and discharges at any stage along this ‘manure chain,’ such as nutrient runoff and the emission of methane gas. Methane, a hydrocarbon and the main component of natural gas, is produced during enteric fermentation and manure decomposition under anaerobic conditions, the latter of which can take place during manure storage and treatment. Methane is classified as a short-lived climate pollutant (SLCP), along with black carbon, hydrofluorocarbons, and tropospheric ozone. While these climate pollutants are short-lived, meaning that their atmospheric lifetimes are much shorter relative to other climate pollutants such as carbon dioxide, they also have much more potent warming effects on the climate. Good manure management, therefore, can not only maximize nutrient and energy benefits to farmers, but also mitigate climate change by reducing emissions of methane. GEP student Leah Germer co-authored a study released in March on this linkage between manure management, farmer livelihoods, and climate change mitigation. 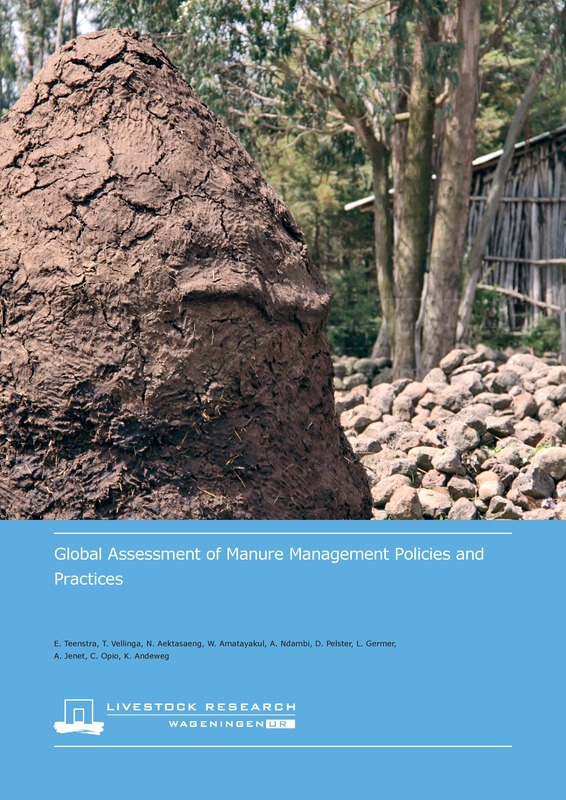 The study assesses livestock manure policies in 34 countries in Asia, Africa and Latin America, as well as manure management practices in Bangladesh, Viet Nam, Ethiopia, Malawi, Argentina and Costa Rica. The results show that key barriers for improving manure management are 1) lack of awareness, 2) low levels of knowledge and missing knowledge infrastructure, 3) limited access to financial credits or other incentives, and 4) ineffective policies and legislation. Leah came to be involved in the study after spending a semester abroad at GEP’s partner institution in Costa Rica, the United Nations affiliated University for Peace. Through her natural resources field course there, Leah was able to visit CATIE’s campus and set up a summer internship at the Program for Livestock and Environmental Management (GAMMA). Leah’s main contribution to this study is the Latin America policy assessment, which is based on the interviews and farm visits she carried out as an intern at CATIE. She will continue to work with CATIE this summer on the follow-up project to this study, in which six proposals to improve manure management based on the results of this study will be implemented in the coming year. Led by Wageningen UR in the Netherlands, the study was a collaborative effort between the Livestock Research, Food and Agriculture Organization of the United Nations (FAO), the Stockholm Environmental Institute (SEI) in Bangkok, the International Livestock Research Institute (ILRI) in Nairobi, and the Tropical Agricultural Research and Higher Education Center (CATIE) in Costa Rica. The study was commissioned and funded under the Agricultural Initiative of the Climate and Clean Air Coalition (CCAC), an international effort of the United Nations Environment Programme (UNEP) and the governments of Bangladesh, Canada, Ghana, Mexico, Sweden and the United States to reduce the emission of short-lived climate pollutants. In addition to livestock and manure management, the CCAC Agricultural Initiative also commissions and funds research on the other primary sources of agricultural SLCPs: open agricultural burning, paddy rice cultivation, and enteric fermentation. To read more about mitigating climate change through livestock management, please see Gerber, P.J., Steinfeld, H., Henderson, B., Mottet, A., Opio, C., Dijkman, J., Falcucci, A. & Tempio, G. 2013. Tackling climate change through livestock – A global assessment of emissions and mitigation opportunities. Food and Agriculture Organization of the United Nations (FAO), Rome.